For sometime now I have been sharing a weekly sparkenation here and other places. This week I shared the following and received a lot of emails asking for my thoughts on how, which is what this blog is all about. How skillful are you are letting go when you need to and being persistent when you need to be? More however: do you know the difference between persistence and stubbornness or futility? There are situations where we simply need to turn off our persistence tap and move on. There are situations where we need to keep at it. How good are you at letting go when you need to and keeping on going when you need to? Knowing when to quit and when to keep going is a critical skill for success and it requires acute self-awareness and a deep understanding of the intentions and commitment levels of other people. You are 100% responsible for your intentions, feelings, thoughts and actions. If your life is not how you want it to be, modify or change your intentions, feelings, thoughts and actions. Sometimes we need to change all four! 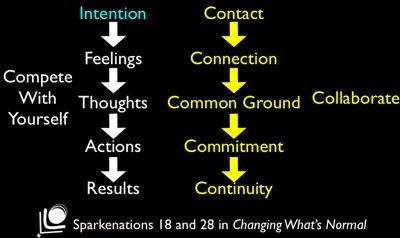 As a general rule feeling change follows intention change and thinking change follows feeling change. Actions follow. You are not in any way responsible for other people’s intentions, feelings, thoughts and actions. Get over it if you have negative feelings or thoughts about what people do or don’t do. Only collaborate with people when you are certain of a shared-view with them about where you’re going, why you’re going there, how you will get there, and who will do what and when. Collaboration is all about relationships. You are only accountable for your side of any relationship. 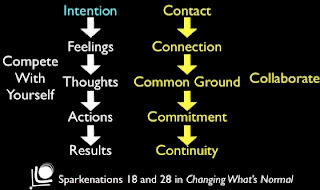 To better a relationship change or modify your contact, connection, common ground and commitment with the person or people. If your modifications or change do not result in a continuity of the relationship, move on. Life’s too short. Make a list of the crucial things you know about life and business. Be brutally honest with yourself about the gap between what you know and what you are doing and get about making changes so that the gap is as narrow as you can possibly make it. You are unique just like everybody else! Identify your talents/gifts and start enhancing them through doing your own work, engaging mentors and belonging to groups that will enhance your specialness. “Do what you love in the service of people who love what you do.” says Steve Farber which I think is brilliant advice. Success is about knowing your niche or micro niche and being remarkable at delivering the value to people in your niche or micro niche that they demand, desire, and feel that they deserve. When I stopped having expectations of other people disappointment disappeared from my life. When I fail to meet expectations of myself I have only got my myself to blame which spurs me on to have high expectations of myself and to meet them so that I don’t have to feel bad about myself. If you were stripped of all your possessions and people in your life who would be be? Love that person. Let go of all attachment. It is perhaps the most freeing up action we can take. Focus on being who you truly are and bringing that person to everything you do. You will be rewarded. You won’t need to be however because you will have discovered a great truth that being happy is about giving far more than it is about receiving. A shared-view with others, both in your personal and business lives, about where you’re going, why you’re going there, how you will get there, and who will do what and when is a sign to continue to go with the flow. When there is an absence of shared-view about where you’re going, why you’re going there, how you will get there, and who will do what and when, maybe it’s time to quit and move on!